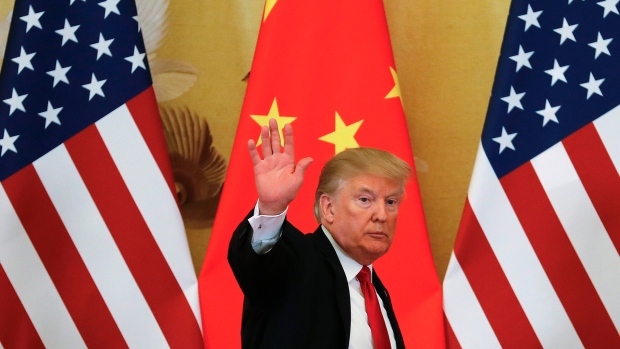 U.S. President Donald Trump is firing the biggest shot yet in the global trade war by imposing tariffs on US$34 billion of Chinese imports, delivering on a promise to his political supporters that risks provoking retaliation and harming the world economy. The duties on Chinese goods will go forward just after midnight, Trump told reporters on Air Force One on his way to Montana on Thursday. Another US$16 billion of goods could follow in two weeks, Trump said, before suggesting the final total could eventually reach US$550 billion, a figure that exceeds all of China’s annual goods exports to the U.S.
As of 12:01 a.m. Friday in Washington, U.S. customs officials are set to begin collecting 25 per cent tariffs on Chinese imports of goods ranging from to farming plows to semiconductors and airplane parts. It’s the first time the U.S. has imposed tariffs directly aimed at Chinese goods following months in which Trump accused Beijing of stealing American intellectual property and unfairly swelling America’s trade deficit. Chinese stocks have taken a beating in recent weeks, entering a bear market, as concerns about the trade war have mingled with worries about China’s ability to control its debt and maintain growth. U.S. stocks are up slightly more than 2 per cent this year as investors have weighed the threat of trade frictions against the strong performance of the U.S. economy. Trump is doubling down on his promise to put “America First” in the nation’s foreign and economic policies. He blames China for a bilateral trade deficit of US$336 billion and for costing U.S. manufacturing jobs. Politically, the get-tough-on-China campaign is aimed at helping score points with the voters who propelled Trump to the White House even though some members of his Republican party -- particularly those in farming states that could be hit by retaliation -- urged a retreat. Failure that brings economic pain could cost Republican seats in November’s mid-term elections. As a candidate in 2016, Donald Trump won support with a promise to redress an unbalanced trade relationship with the rest of the world. In the White House in 2018, he has started to make good on that pledge. Bloomberg Economics’ base case remains more trade skirmish than trade war, but the risks are increasing.-- Jamie Murray, Bloomberg Economics Read more for the full research note on economic costs of a trade war. The tariffs could jeopardize an upswing that extended to nine years on his watch and pushed the jobless rate to the lowest in nearly half a century. U.S. and Chinese companies will now find it costlier to trade with each other, meaning less demand and higher prices. The International Monetary Fund warns an extended spat could undermine the strongest global expansion since 2011. The extent of the economic damage will depend on how far both sides go. If the U.S. and China cool off after a first round of tariffs, the impact on their economies will be modest, according to Bloomberg Economics. Under a full-blown trade war in which the U.S. slaps 10 per cent tariffs on all other countries and they respond, the economists reckon U.S. growth would slow by 0.8 percentage point by 2020. Vehicles could be the next battleground. The Trump administration is reviewing whether to introduce duties on imported cars and trucks in a bid it says to protect U.S. national security. The threat deepened tensions with the EU, which warns that car tariffs would inflict pain across its 28 member states. Trump argues that his approach will force other countries to trade more fairly, reducing America’s US$552 billion trade deficit and prompting employers to return to America. But recent U.S. tax cuts and spending increases will probably buoy the dollar and the nation’s current-account deficit anyway, the IMF said this week. That could set the stage for a prolonged conflict with Beijing, which has shown little interest in making fundamental changes to its economic model. Xi has balked at U.S. demands to stop subsidizing Chinese firms under his plan to make the nation a leader in key technologies by 2025. Negotiations between the two countries petered out with the Chinese accusing the U.S. of blackmail. The U.S. imports much more from China than the other way around, giving the U.S. an advantage in a tariff dispute. That means Beijing could focus on introducing bigger regulatory or tax burdens on American companies who operate in China or want to tap its growing market. It could even take the drastic steps of devaluing the yuan or reducing its US$1.2 trillion holdings of U.S. Treasuries, measures that would hurt it as well as the U.S.